Today's letter is "B" (I'm already starting to feel a little Sesame Street vibe with the A-Z challenge!) My theme was an easy one because today is the Margie & Me color challenge reveal and I made a beaded bracelet. I only used one color palette this time around. I really enjoyed it - yellow and all. 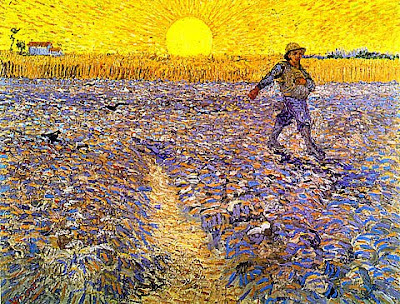 Van Gogh has always been a favorite of mine and I was drooling over this painting. I realized upon further inspection that I had quite a few yellow beads. And as I gathered all my colors together, I knew a free form weaving project was in order! At first I thought I was going to make a necklace, but I kept pulling the long strand in half and realized that it was a bracelet waiting to be made! Thanks to Marcie who graciously hosts these great challenges. I am inspired to head out to the bookstore today and pick up a book of Van Gogh prints today for more study in color! Your free form bead weaving is my FAVORITE of your many beading techniques - and THIS? THIS is AMAZING!!!!!! The colors are DIRECTLY out of the painting!!!!! I. Am. Blown. AWAY!!!!! Oooh..I love it! 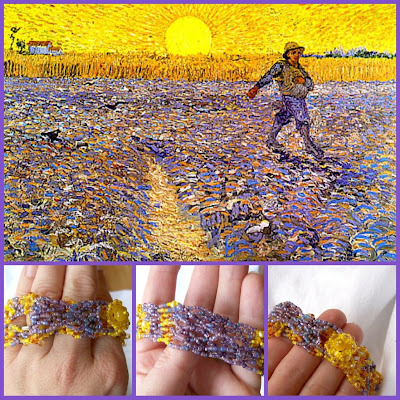 Your bracelet captures Van Gogh's colors as well as the great brush strokes and texture! Lovely! I love Van Gogh! And that bracelet! What a creative idea to incorporate the two. Well done! Wow. What a great bracelet! It really looks just like the painting. Wonderful job Amy! You really rocked this one, girl! Your colors are spot on, and who was afraid of yellow? Not you! Really, really beautiful bracelet. Fantastic inspiration and gorgeous result! "ooo, pretty beads!" gus gus. i like the van gogh connection and the bracelet turned out very nice! happy b day! ANother beader on the A-Z challenge!! Love the colors of the bracelet! Another A-Z challenge beader! Yay! 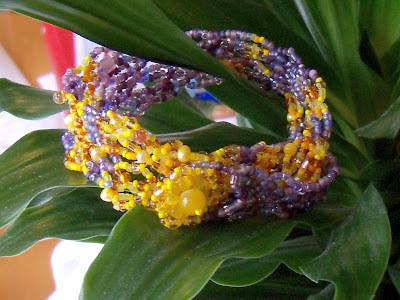 I love the colors in the bracelet--a perfect match to the painting! Stunning! I can completely understand your desire to be number 1000 in the blogging challenge!! congratulations! I love how you've used the Van Gogh as inspiration for your beading, absolutely beautiful. If I beaded, I think I'd be envious. Oh WOW that color combo is amazing! I love your bracelet....just gorgeous! van Gogh painting. The design of the bracelet is amazing!